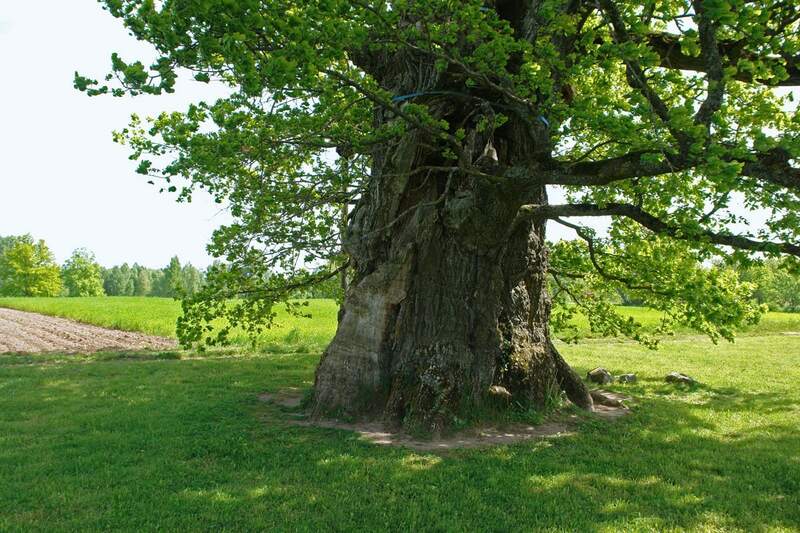 The largest (thickest) tree in Latvia and Baltic States is Kaive Oak – a beautiful tree which has a circumference of 10.4 m.
Searching for noble trees (large trees which exceed certain size limits and thus are protected by state) by many in Latvia is seen as a good passtime during the weekends. 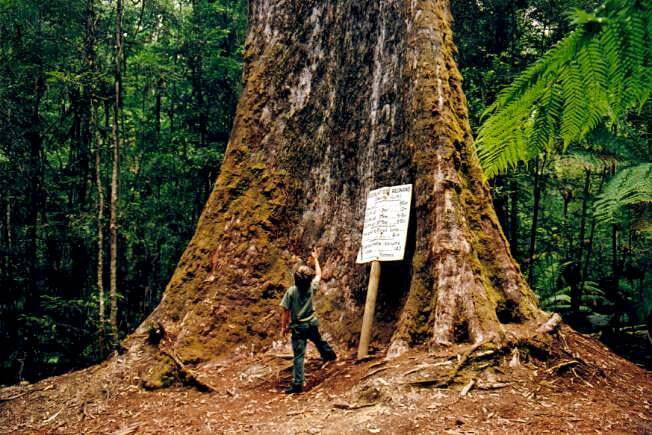 Thousands of such trees have been registered and the largest ones are marked and mentioned in tourist guidebooks. Thickest trees in Latvia are oaks (Quercus robur) although there is a fierce competition with willow-trees. Several oak trees exceed the circumference of 9 meters: Rīgzemji oak has a circumference of 9.6 m, Kaņepji oak – 9.4 m and the magnificent Sēja oak – 9.1 m.
Nevertheless only one tree in the Baltics exceeds the circumference of 10 m – this is Kaive Oak in Western Latvia. This oak tree grows near the centre of village, among farmsteads and, of course, locals knew well about this giant tree. 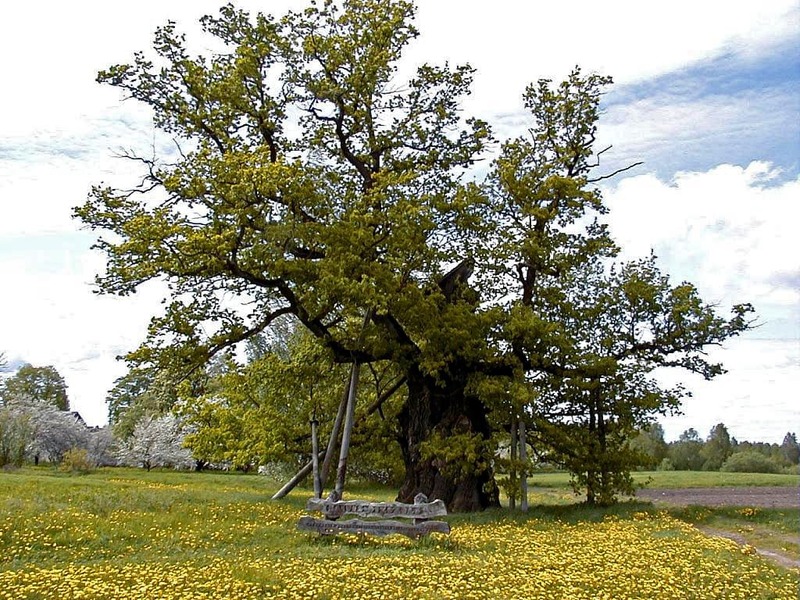 The quest for the largest tree in Latvia became trendy during the 20th century and, of course, Kaive Oak was known as one of the largest ones. Around 1940 its circumference was some 8 meters but the first known exact measurement was made in 1974 when the girth was 9.35 m. Since then the tree was grown in thickness: by 1990 it exceeded 10 meters and in the spring of 2014 there was reported a circumference of 10.4 m. All measurements have been made at the height of 1.3 m.
Kaive oak grows in a picturesque meadow among orchards. From the distance the tree does not seem to be very large – and it is low indeed, just some 18 m high. Its summit was chopped by a lightning in 1920ies and several large branches broke in 1990. Since then this tree has been tended well and with love: largest branches are supported and the enormous hollow is covered with a fine roof. The age of the tree can not be determined. Some oaks in Latvia have reached giant size over one century while others never grow to large size: thus the size of the trunk does not tell too much about the age of tree. kaive Oak is a local tourist destination and people often leave small offferings – coins, fine webbings or just colored rags. Small car parking is near the oak and a trail leads towards it. Although sometimes it is considered that this was a sacred tree for local paganic cults, there is no evidence to support this. Nevertheless it might be true: there are rather many trees in Latvia which have served as paganic shrines. 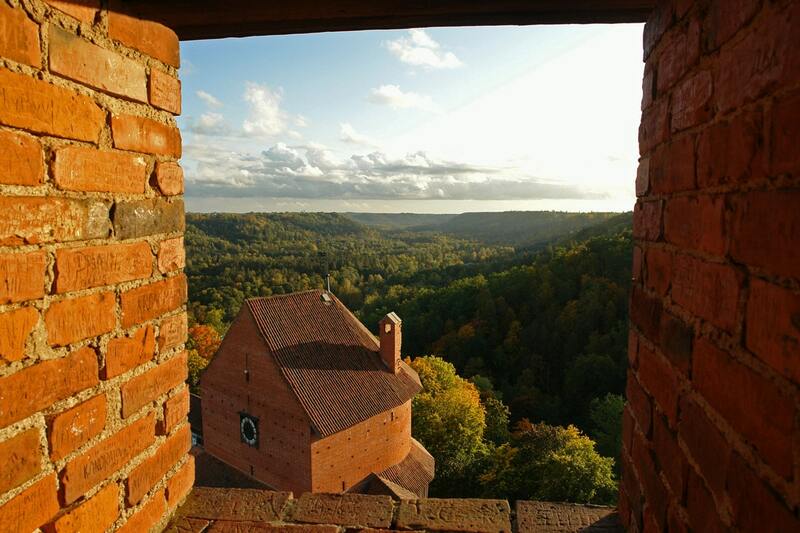 Highlights of Latvia are the rich architectural heritage in Riga City, numerous palaces, country houses and castles. Professional arborist and award-winning nature writer William Bryant Logan deftly relates the delightful history of the reciprocal relationship between humans and oak trees since time immemorial―a profound link that has almost been forgotten. From the ink of Bach’s cantatas, to the first boat to reach the New World, to the wagon, the barrel, and the sword, oak trees have been a constant presence throughout our history.